Click here for pics of 2019 retreat and testimonials! Unfortunately, we have lost our venue for this retreat. I am currently searching for a new, wonderful venue for us! The dates and location for this retreat may change... please email me (Tabetha), if you'd like to let you know when the dust settles on the new plan! Join me for a journey of art, sisterhood, food, and exploration! The Phenomenal Woman Art Retreat will help bring your creative practice to the next level. More than just an opportunity to paint on vacation, this retreat offers a unique travel experience that will inspire and awaken the artist in you! 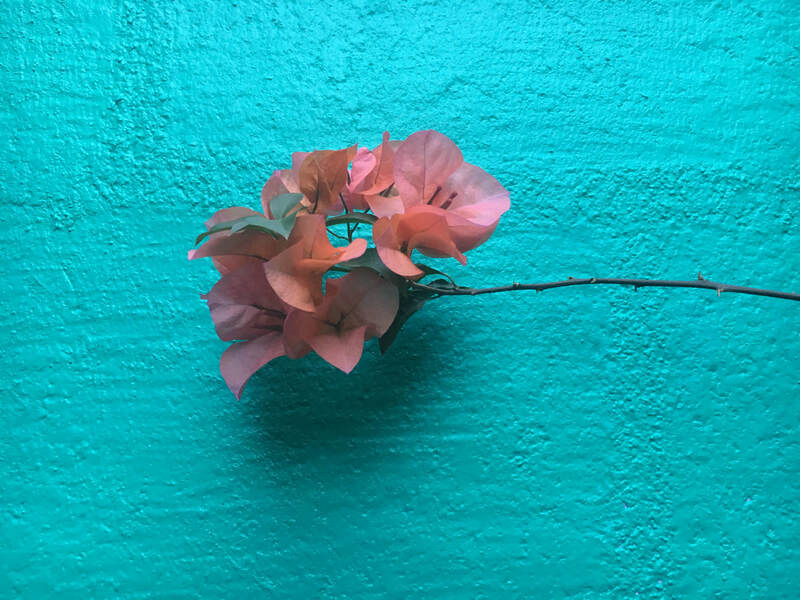 We are a small group of women, venturing to Oaxaca City Mexico to immerse ourselves in art. We will paint and sketch daily, visit art studios, museums, and cathedrals. We will explore the city, and I'll help you develop your "artist's eye'. You will learn some great techniques to create art on the go and to develop a daily creative practice. Got creative blocks, or not even sure you're creative? Not a problem! We will work with busting through any creative blocks, and help you uncover your creative side if it's become a bit dusty. Creating art is an incredible way to record the memories. And creating art in a new place brings new ideas, inspiration and completely new art.. When you get back home you'll look at your sketches, paintings, writings and (art) journal and be transported back to the great moments you had in Oaxaca. Don't worry - you don't have to consider yourself an artist to join us! This is more about the process than the product - you just have to be willing to dive in and explore your creative side. I'll help you develop your "artist's eye" as we gather inspiration for our paintings, and transform that inspiration into art. This will be a small group of women, and a safe, nurturing environment, so you can let your hair down and create friendships, memories, and art. Every woman is phenomenal in her own way. What makes you phenomenal? Lets embrace and celebrate it! Oaxaca is the perfect place for an art retreat because it is an art town. Just seeing pictures of the vibrantly colored buildings makes me want to paint! There are amazing murals, museums, galleries, and loads of folk art. Art is everywhere in this city. Oh, and the cathedrals! There are dozens of them, all works of art themselves. Early in 2017 I was inspired by the Women's Marches across the country. It was beautiful to see women come together and march through the streets all over the world. There is this myth that women can't work together. I've never understood nor experienced it. Perhaps it's been fed to us by people who want to keep us separate. ​We are more powerful together. I was moved to create an ongoing series of paintings - and classes - called "Phenomenal Women" to bring women together to celebrate the different aspects of being women; including sisterhood. Some of the paintings we've done have been Power, Dancing Through the Storm, Freedom... to name a few. I have found these classes to be powerful and affirming. When the opportunity arose for me to lead a retreat in Mexico, it only seemed natural for it to be a group of women, so of course it's called "Phenomenal Women". Why an all women retreat? Something magical happens when there are no men around. Women feel free to let their hair down, and to say what we feel. I believe that in a group setting women feel more empowered without men around. What will we do in Oaxaca, and what does the registration fee include? With your registration you'll get 6 nights lodging, 6 breakfasts and 4 lunches. The fee also includes walking tours and guided visits to see painting studios, murals, galleries, museums and the Frida Kahlo art store! We'll be staying and creating in the studio at the Art House Oaxaca! The Art House is an artist residency created by Lisa Sonora, an American artist who lives in Oaxaca. 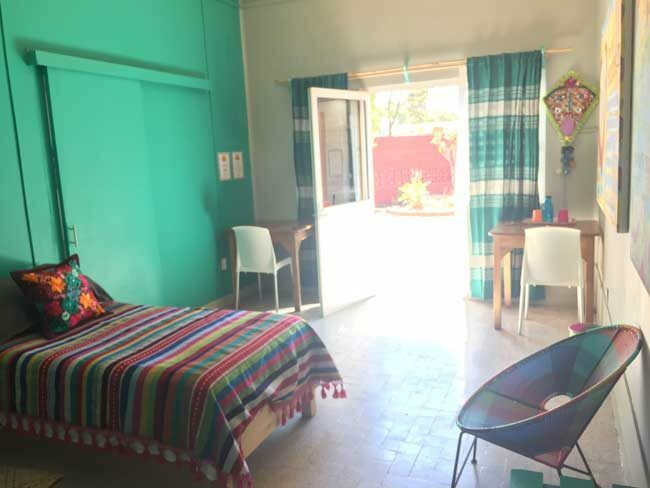 Each room has two twin beds, a private bathroom, 24 hour access to the outside studio space, and a communal kitchenette with refrigerator, stove, filtered water, dishes, and electric tea kettle. There is also a cafe on site, and six breakfasts and three lunches are included with your registration fee. Dinners are not included, which gives us a chance to sample several local restaurants! Everything is an easy walk from Art House Oaxaca. Taxi’s are easily available and affordable if you prefer not to walk. Everyone will likely pair up for dinners, or we'll go as a group, so don’t worry about dining alone. Intrigued? Click here for more details! Oaxaca is a Unesco world heritage site in recognition of its treasure of historic buildings and monuments. It has more than 20 cathedrals within the historic center, towering limestone walls, and secret gardens behind every adobe wall and doorway. Oaxaca is known to have a rich art scene, amazing food, and friendly people. All of this will renew our creativity and inspire our painting! ​You will be provided a list of art supplies, but basically we're using acrylic paints, paper, and you will need an unlined journal. None of the supplies need be expensive and you are always welcome to improvise with what you already have. Also, we will take a trip to the Frida Kahlo art store, so you'll be able to pick up more supplies there if you like. Ready to join me on this creative journey? The bedrooms are brightly decorated and comfortable. Each one has it's own outdoor access, and a private bathroom. The rooms are double occupancy, so unless you sign up with a friend, you will be paired with a roomie. Or, if there's space you can have a private room for an extra fee. This is the private outdoor studio where we will be making art! There is plenty of room to spread out and make a mess! We can paint sitting or standing, with our work surface horizontal or vertical. So nice to have space and options! You'll have access to this space 24/7, so if the mood strikes in the middle of the night, you can get out and paint.